The past 4 weeks, I’ve been on a high. I delivered a 4-week live coaching program called 2015 Jump Start… but it was different than anything I had done before. Partly because rather than charge $5K, people were able to come in and pay what they could. So I rolled up my sleeves and answered questions. Each question took us deeper into what really works. There were no “canned presentations”. And the feedback was the best it’s ever been. People who had felt overwhelmed – and never made a sale before were having massive breakthroughs. Everyone who attended didn’t want the sessions to end. Do I follow my “marketers” instinct? I know it’s worth well over $100+ per month. And I could easily fill 500 or so spots with a few emails to my list. I don’t care how much you make… that’s still really good income. But then I started to read the feedback again – and how much people appreciated being part of such an experience even though they didn’t have thousands of dollars to invest. People who said they had tears in their eyes because someone finally understood them – and wanted to help. Believe me, I remember what it was like. And while in the “IM” world, we say things like, “hey, it’s just $500 – why would they need a payment plan?”… but the reality is many people do feel $500. Heck, my first paycheck while working full-time at the children’s hospital was $700 – and that was for TWO-WEEKS of work! That’s how I lived.. for SIX YEARS. I’ve been blessed. Very blessed over the past decade. To be generate the kind of income I do while working from my local Starbucks. I get it. And even though I can’t stand the word “guru”, that’s what people have called me. So it’s time for a “guru” to step up – and give without thinking of their own pocketbook first. To truly put their clients first. I never cared for elitism. Or doing what everyone else did. 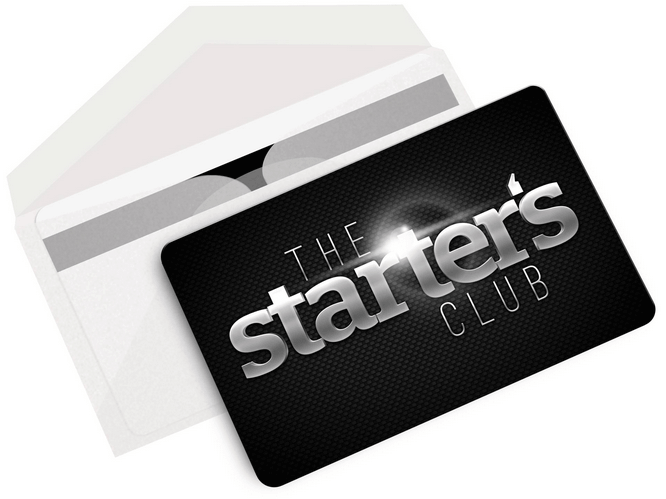 You can be part of a brand new club called The Starter’s Club. Every week, we’ll do a live training session. One week might be a full Q/A where we answer questions and dig in deep. Another week might have a special guest.. like one of my clients who just did over 1,000 sales of his $97 product in 5 days. This will be a REAL group coaching program. The same kind of programs I’ve charged $100/month+ for. During the launch, it will be a “Name My Price” offer. Meaning you tell me what you think it’s worth each month… and you’re in. And you’ll never pay a penny more. Why the heck would I do this? Why would I let people pay their own price when I could easily get $100 per month for this? I told a few colleagues about my “Name My Price” monthly program… and they thought I was insane. They told me how some people will take advantage of me and how much I’m leaving on the table. But I’m following my gut. I’ve done very well in my businesses… and, as corny as it sounds, you can’t imagine how good it feels to offer something like this. Let’s be very clear… I don’t want to use the words “give back”, because this is not a charity and you are not a charity case. You’ll pay to be a part of this.. but you just pay what you can. I can’t stand elitist crap. Never could. I feel like a cheesy politician using phrases like “a man of the people”, but that’s how I always felt. I just relate more to the regular everyday person who quietly gets things done than people who feel they have to flaunt their success. The first Starter’s Club session starts next Friday…. let’s do this together. BTW, this is brand-spanking-new. So new, I didn’t even write a sales letter for it. But to be honest.. I don’t think a program like this needs a long sales letter or video to convince you to try it… do you?